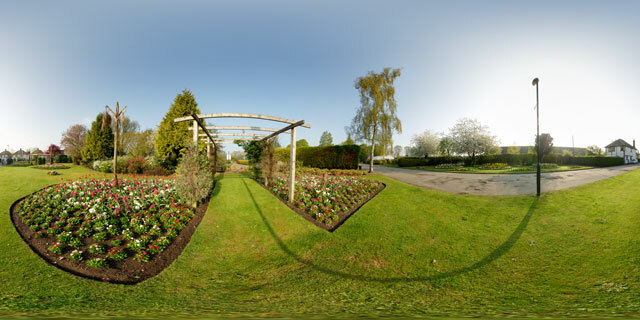 360° VR ultraviolet panorama by the flower beds near the tennis courts in Welland Park, Market Harborough, UK. In ultraviolet, flowers can have quite a different appearance compared to how they look in visible light. The Rudbeckia flowers in this image have a dark area around the centre of the flower, something that is not visible to humans. This kind of pattern is visible on many different species of flower, and is often referred to as a ‘nectar guide’. Bees and other insects can see UV light, and it is thought the dark marking around the centre of the flower helps the insects find the centre of the flower (where the nectar and pollen are located). The french marigold flowers appear completely black in UV, contrasting with their much brighter appearance in visible light. 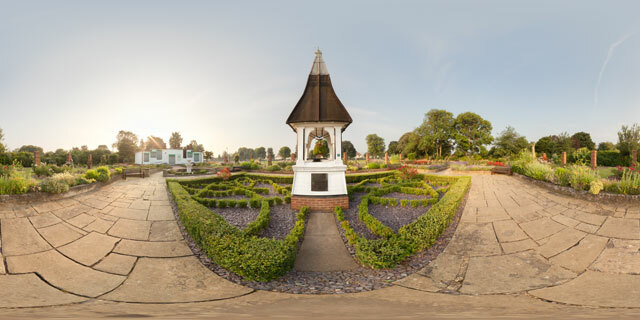 360° VR panorama of the Rose Garden in Welland Park, Market Harborough, UK. At the centre of the Rose Garden is the old Bell Tower from Symington’s factory. This tower was mounted on the roof of the old six storey factory of H. & W. H. Symington & Co. Ltd Corset Manufacturers at Factory Lane, Market Harborough. The Factory, demolished in 1973, was first occupied by the company in 1861 and extended in 1878 when the bell tower was added. The bell was cast by J. Taylor and Co. of Loughborough. During the 1939-1945 war over a million parachutes for the Royal Air Force were produced at the Symington Company’s Market Harborough premises. The plaque was added in 1977 by Harborough District Council to commerate the Silver Jubilee of the ascession of H.M. Queen Elizabeth II. 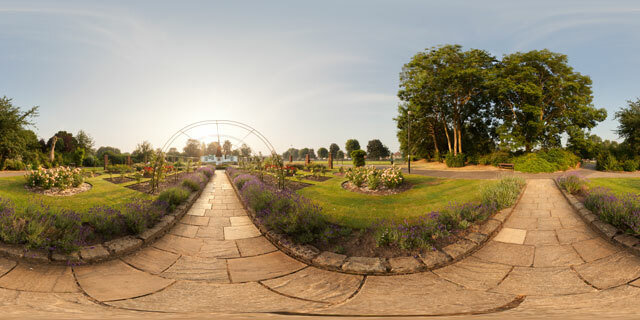 360° VR panorama of the Rose Garden in Welland Park, taken July 2013. Welland Park is located in the town of Market Harborough, Leicestershire, UK. At the centre of the Rose Garden is the old Bell tower from the Symington Corset Factory. The garden is planted with Roses in a variety of colours. As well as beds of Rose bushes there are climbing roses across a frame over the path and up pillars along the sides of the garden. The path through the garden at the eastern end (shown here) is lined with lavender bushes along the edge. 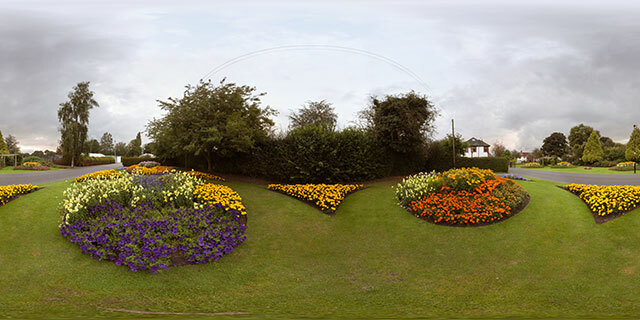 360° VR panorama of flowerbed displays near the south-east entrance to Welland Park, in Market Harborough, Leicestershire, UK. The flower displays are planted by Harborough in bloom volunteers in conjunction with council workers. The displays in Welland Park play a large part in the town’s entry to the East Midlands in Bloom competition each year. 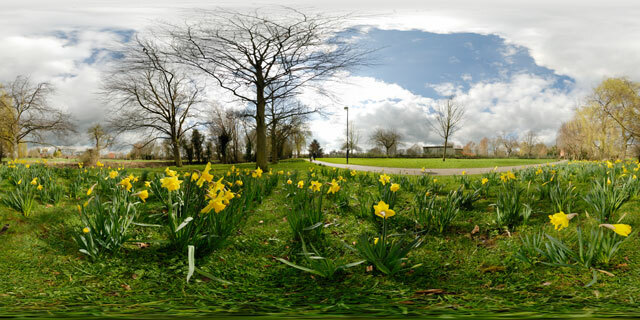 360° VR panorama of daffodils flowering in early Spring in Welland Park, Market Harborough, England. Welland Park is a popular area of the town, with colourful flower beds visitors can admire, and a play area for children. The River Welland runs though the park, and sometimes a Kingfisher can be seen along its banks. 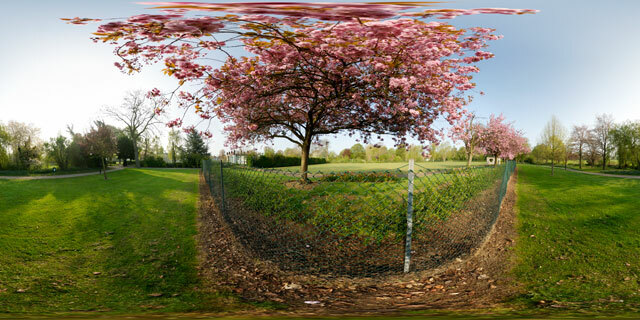 360° VR panorama of a tree blossoms in Spring in the green area to the east of the children’s play area in Welland Park, Market Harborough, Leicestershire, UK. The park is a popular location in the town, with lots of green space, and facilities such as the children’s playground, tennis courts, bowling green, and mini golf. 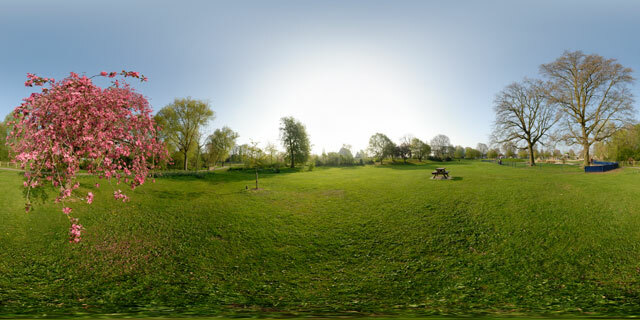 360° VR panorama of blossoming trees on the western side of the bowling green in Welland Park, Market Harborough, Leicestershire, UK. The park is a popular location in the town, with lots of green space, and facilities such as the bowling club, tennis courts, and a children’s playground. 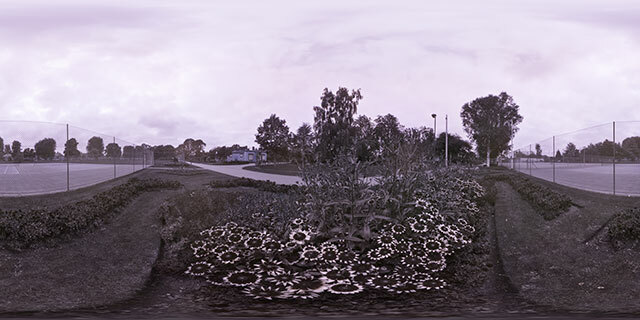 360° VR panorama of flowerbed displays next to the Welland Park Road car park in Welland Park, Market Harborough, Leicestershire, UK. The flowerbeds are planted by a combination of volunteers and council workers. The park is well known for its flower displays, and features as an integral part of the town’s entry into East Midlands in Bloom each year. The town always does well in the competition, usually finishing within the top 5, and winning the competition in 2005. 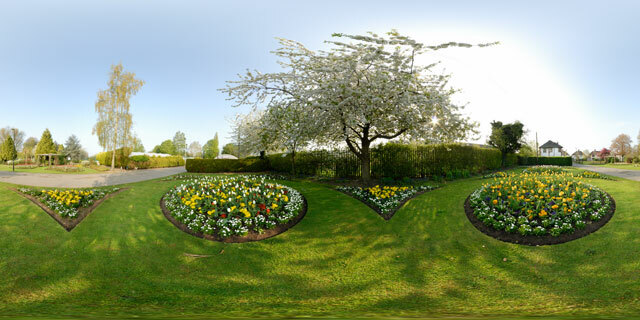 360° VR panorama of a flower display and blossoming tree at Welland Park, in Market Harborough, Leicestershire, UK. The flowerbeds are planted by a combination of volunteers and council workers. A nursery is located in the park, so visitors can buy flowers to take home with them. Welland Park also includes tennis courts, a bowling green, mini-golf, children’s play area, and large grassy areas for sports or relaxing. 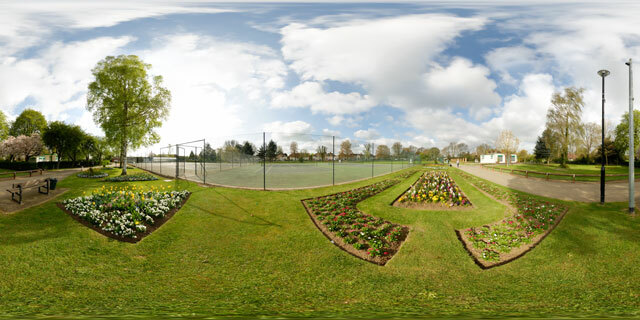 360° VR panorama of flowerbeds on the northern side of the tennis courts in Welland Park, Market Harborough, Leicestershire, England. The park features as part of the town’s entry for the East Midlands in Bloom competition each year, for which the town consistently ranks near the top. As well as the flowerbeds and tennis courts, Welland park also features a bowling green, mini golf, children’s playground, and Rose garden. The park is a popular attraction for both visitors and town residents, and takes its name from the River Welland, which runs through the park.